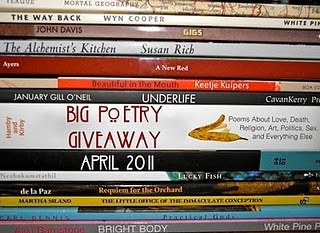 Kelli Russell Agodon, over at her blog, The Book of Kells, is hosting a poetry giveaway during National Poetry Month, which on the West Coast, starts in about 3 hours. I love the idea, so I’ve decided to participate. This means that I will send two books of poetry to one lucky person, selected from among the throngs who respond to this post. So keep those responses coming and you may be the winner! This entry was posted in poetry stuff. Bookmark the permalink. what a great idea for poetry month! I have a very small following– so your chances of winning are great! I’m in — love your comment about a small following. hadn’t thought about that being an advantage! Risa, out of 30+ blogs listed on Kelli’s blog, I came here first because the name of your blog made me laugh. Now that I’ve wandered around a bit, I think I’ll be hanging out here. What a rich and wonderful place. Ooh, count me in too! Joyce, Chella, Kathleen, Margo, Shannon– thanks for stopping by. And thanks for staying a while. Happy poetry month! Miriam- you’re not obligated to write a poem, but I highly recommend it. Jo, you’re in. But I’ll need some contact information for you if you are the winner. Please count me in and feel free to stop by my blog for another chance to win. Please toss my name in the hat! Thanks! Thanks for doing this giveaway and giving me a chance to win! I’m doing a giveaway over at my blog, too if you’d like to have a chance of your own. Thank you for entering my name in your giveaway. Please enter me in your draw. Thanks! Awesome. Enter me please. I’m doing this at my blog as well…swing by and enter! Hello and Happy Poetry Month! Please allow me to be (what I’m guessing is) the final entrant in your giveaway. 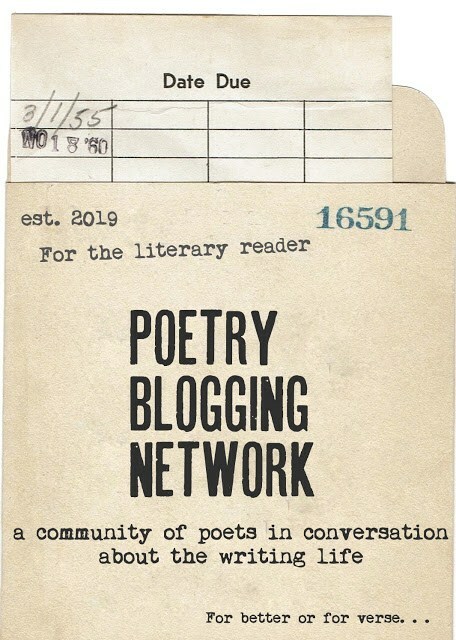 I’m sad that I seem to be the only one to rush around signing up for the Big Poetry Giveaway at the last minute, I thought the Internet was full of procrastinators!